With MJK cabled sensors, it is easy to position the transmitter with the display, where it can be useful, and the large display allows viewing from a distance. Shuttle has a one-step measurement start-up procedure. that is easy to follow and easy to modify the set-up of all functions, controls and signal management features. The advanced on board software ensures accurate and reliable operation even in difficult applications. 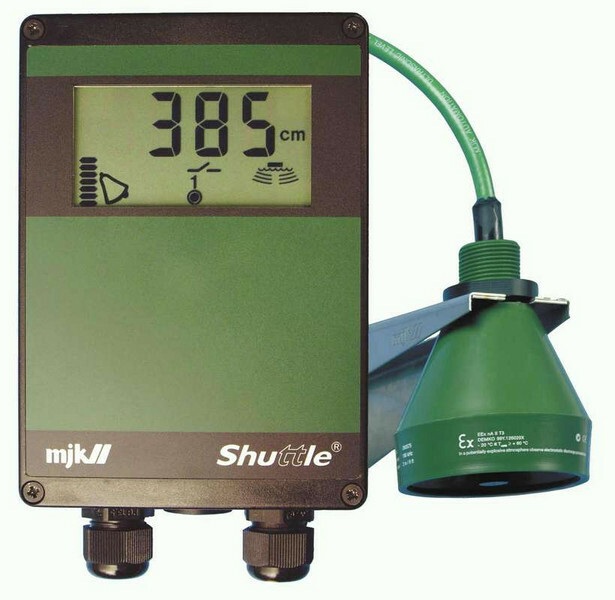 Use the Shuttle® Ultrasonic Level Transmitter for level measuring in tanks, wells, containerss, weirs, flumes, canals, etc. Shuttle® is an advanced microprocessor based ultrasonic level meter with an intelligent, precise measuring system utilizing the latest hardware and software technology. Shuttle® provides simple and logical operation, using advanced technology resulting in a high quality product at a competive price. MJK’s Shuttle® measures, displays, transmits and controls levels for about the same price as the competitors’ stripped-down transmitters, plus you get the high quality product you expect from MJK. Click the button below to add the Water Level - Shuttle® Ultrasonic Level Transmitter to your wish list.